1. You will become part of an extended family. Most of us live far away from relatives and the places where we grew up. We have found an extended family in the warm and caring Congregation Emeth community. 2. You will become part of a group of spiritual seekers. 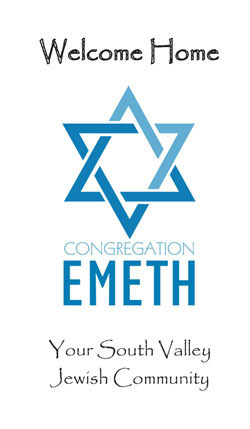 Members of Congregation Emeth come from a variety of backgrounds: traditional, liberal and secular Jewish upbringing. All traditions are welcome. 3. Approximately half of our families are interfaith. Non-Jewish spouses or partners are respected, accepted and included. 4. You will demonstrate to your children the importance of being part of something larger than yourself. Through Congregation Emeth, become attached to almost 6000 years of Jewish history and tradition. 5. You will have the support, counsel, and guidance of a rabbi who will assist you in challenging times and life-cycle events. Rabbi Israel also will provide you with support and tutelage concerning Judaic identity and education . 6. You will have people nearby to celebrate with you in times of joy and comfort you in times of sorrow. 7. You will have opportunities to volunteer your service to both the synagogue and the greater community. 8. You will help your children learn Jewish values, history and tradition. For children who have no other Jews in their public school classroom, their relationships with Emeth children will forge a tight bond that will endure throughout their school years and beyond. 9. You will receive complementary High Holy Days tickets for you and your household; discounted facility rental fees; opportunities to enroll your children in our member-only Jewish Studies and Hebrew Studies; and eligibility to receive bar/bat mitzvah instruction for you and your children. 10. And let’s not forget food. Where else in the South Valley will you find kugel at a potluck supper or argue about whether chocolate belongs in hamantaschen?